Tri-Blend 50% Polyester / 25% Cotton / 25% Rayon. Polyester retains shape and elasticity; cotton lends both comfort and durability; addition of rayon makes for a unique texture and drapes against the body for a slimming look. 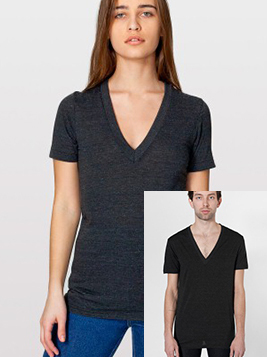 Durable rib deep V-neckband.